Sprucing up your space might be on the “honey-do” list this year. So what looks good in 2011? The natural look. Embracing the styles of openness and freedom of the outdoors and integrating them into your home continues to be one of the hottest home design trends in 2011. A small change, such as a bathroom makeover, might be all it takes to put some pizzazz back into your home. If a breezy, spacious look is the style you crave, check out the 2010 winning design styles chosen by the National Kitchen and Bath Association. The latest issue of USA Home & Remodeling featuring New Idea TRENDS (Volume 26, No 9), highlights the Southern California design award winners in the 2010 NKBA Competition. The natural tones and hues featured in these designs quintessentially link the great outdoors into your interior space. Vintage Tub & Bath carries many options for the tasteful home designer/remodeler when creating their own bathroom makeover, including bathroom linens made from renewable bamboo fibers in natural colors. Much of your style and pizzazz for your new bathroom can easily fit into your budget. Are you more of a modern thinker yet tight on space? Modern styles are hot this year too, and you can combine a modern, space-saving sink alternative with a wall-mounted sink along with a corner tub (another trend this year!) 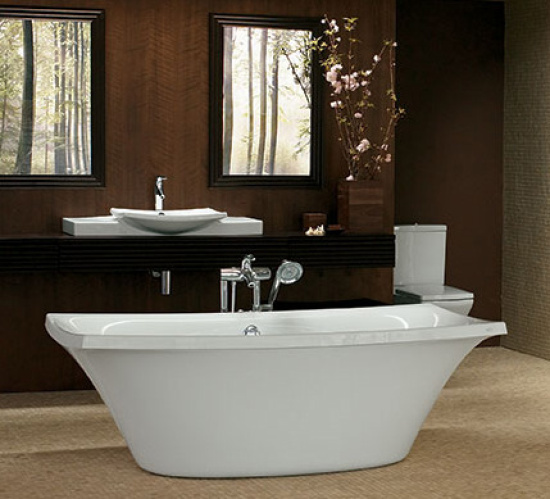 If a corner tub isn't your style, take a look at these contemporary bathtubs. Of course, modern thinkers can think big too. Modern doesn’t have to mean ‘minimal’. Whatever your choice, natural or modern, professional designers all suggest the complementary touch in your bath of adding a little green. Natural or modern styles both thrive longer with lush, green plants exuding life and sprucing up your space by representing the great outdoors, inside your castle.